Sinful anger is usually defined as the irrational desire for vengeance or the blinding of reason. There is such a thing as right ordered anger, or righteous anger. St. Thomas Aquinas discusses anger in the Summa Theologica and his argument can be found here. I want to focus on anger as it pertains to the blinding of reason. I have had periods of my life where I have struggled with sinful anger, so I recognize it when I see it and it is very apparent to me in the written form through social media. Yesterday I wrote an article on Pope Francis, which much to my amazement, has struck a chord for thousands of people. It appears that my friends and myself are not the only ones who have witnessed the distressing trend for many Catholics to ignore the Pope, try to be the Pope, or to limit the Church’s mission. It seems that many people have noticed a move away from the mission of bringing the world to Christ, and that many of our fellow Catholics are getting lost in the weeds. The comments in response to my post have been less vitriolic than I expected given how popular the post has been. I am very thankful for that fact. I have seen or been in discussions on this topic that are downright nasty. That is precisely why I wrote the piece that I did. I want us to focus on the mission and move away from tearing one another down. I have observed a sect within the Church, I say sect, because they seem to be trying to carve out their place within the Mystical Body, when there is no carving to be done by the very nature of the Church. They engage in intense, irrational, and offensive Pope-bashing that betrays a blindness to reason. It is impossible for many of us who understand the Church in a fuller light, to explain the situation to them. They have turned in on themselves (which is a Medieval understanding for the sin of pride) and do not want to think or pray about it. They also tend to lord over people in a superiority that is distressing, especially since the great majority are not theologians or highly educated on such matters. They take their cues from the media, to their own detriment. Sinful anger comes from a lack of trust and fear. It arises from a lack of control. As Catholics, we have very little control over the hierarchical aspects of the Church. Quite frankly, that is how it is supposed to be because of the nature of the ministerial priesthood’s place within the common priesthood of the Church. I will save that theological topic for another day. Part of being a member of the Church is a letting go. When we are Baptized we agree to die to self. That means obedience to the Church, and I think trusting that the Holy Spirit is guiding the Church even while sinful men (and women) work against Him. No we don’t have to agree with every word uttered out of the Pope’s mouth or the Bishops’, but we have an obligation to love and respect them all the same. If they are teaching on faith and morals, then we absolutely need to be listening. The Church’s teaching comes from God, not men. When we allow sinful anger to blind us, then we essentially give up our use of reason and go wherever the anger takes us. We read articles about the Pope that are inflammatory, deceitful, untruthful, or incomplete. That’s what sells in the media, including in Catholic media. That is why by and large I write about Catholic Culture from the perspective of holiness rather than polemics. The path to holiness is not to be found in polemics. The path to holiness is found in Scripture, prayer, theological study, and reading about the lives of the saints, and then taking that knowledge and living it. More than anything, sinful anger takes us away from Our Lord, Jesus Christ because we cave in on ourselves. Our own struggle for control, the “I can do it better” attitude puts us in the same position as Adam and Eve in the Garden. We desire to be God. We desire to tell the Holy Spirit how to lead the Church. More than anything, we place our trust within our own finite and limited control. We forget that Christ calls us to obedience, including to the Magisterium of our day. We forget that Pope Francis is Christ’s representative on earth and is worthy of the dignity, love, and respect of that office. He should not be the topic of pernicious gossip or attacks. I am not talking about papal idolatry, which I have also seen. I am talking about a healthy regard for the Vicar of Christ and the hierarchical part of the worshiping community, the Church. I am going to say this again. The Church has always had struggles. There has been sin and corruption at all levels. Pope Francis is not corrupt, but there are people within the Vatican who most assuredly have turned from Christ and given into sin. I think what is going on with the German Catholic Church is a good example. Concupiscence is a struggle for all of us, including bishops, cardinals, and the pope. 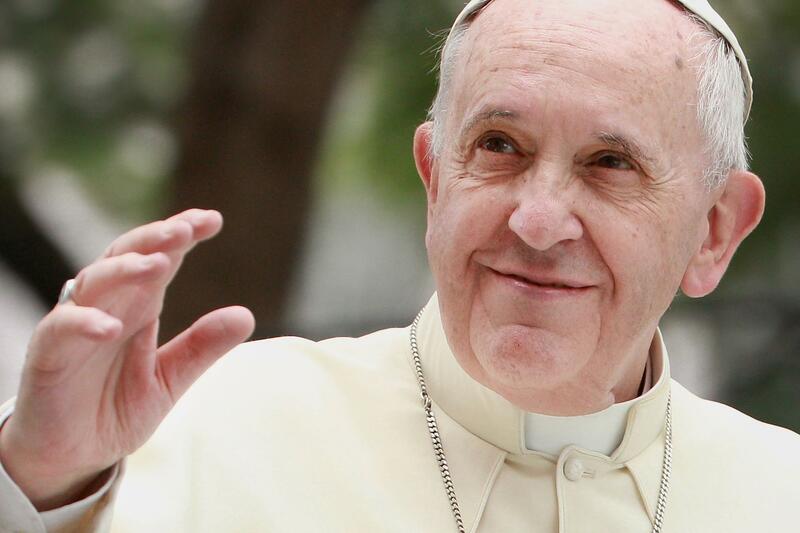 People are not perfect, and even the pope will make statements that give many of us pause. When that happens, I trust in Christ’s promise to the Church. I also know as a former linguist, that translations are difficult, especially colloquialisms. Much of what is reported is misleading or bad translations. I know with every fiber of my being that irreformable doctrine will never change. That includes contraception, abortion, “gay marriage”, etc. If the Church can survive for 2000 years of violence, corruption, hedonism, stupidity, heresy, and division, then she can survive in the post-modern world. We cannot lose sight of the big picture. More than anything, we cannot lose sight of Christ and the mission to bring the world to Him. The choice is ours. We can close ourselves off from Christ in anger, fear, resentment, and envy, or we can trust Him. The comments I see on social media are a page right out of the Gospels from the lips of the Pharisees. That makes me sad. It makes me hurt for those people who would restrict themselves from the Mystical Body. Sinful anger can easily become a mortal sin. It is something that we must guard ourselves against, for our own soul’s sake. In the end, it is not worth the stress and anger. Stop reading the mainstream media on the Church. Stop going to blogs and websites with in the Catholic Blogosphere that are intentionally inciting anger and division. If we want to bring about change within the Church and in the world, then we must strive towards holiness. God gives us the opportunity to love and serve the people we come into contact with throughout our day. Those are moments when we can share our joy. We can’t do that if we are wrapped up in anger and fear about what might happen. Usually we are wrapped up over things that will never happen i.e. changes in doctrine. I am trying to bring some sense of reason and peace to a growing problem. I love Christ, in my fallen, broken, sinful way. I love the Catholic Church. I do not like to watch people tear themselves or the Church apart because of their anger. It is impossible to reason with people when they are that angry. Ask my husband. If we ask, Christ will give us the peace that we need in the face of growing secularism and problems within the Church. Trust in Christ and the rest will fall into place. God bless.